Running through February 8, the FWSSR brings 23 days of heart-pounding rodeo, live music, world-class livestock, cowboy cuisine, kid friendly exhibits and much more to the Will Rogers Memorial Center in Fort Worth. NBC 5 is proud to be a sponsor of the show -- and happy to participate, as well. Come out and see NBC 5 Meteorologists David Finfrock, Rick Mitchell, Grant Johnston, and Remeisha Shade riding in a classic stagecoach during the Fort Worth Stock Show All Western Parade on Saturday, Jan. 18, at 11:00 a.m. in Downtown Fort Worth. This year’s parade route will navigate from the Tarrant County Courthouse, then Main Street to 9th Street, proceed west on 9th to Houston Street, turn north on Houston Street and end at back at the Courthouse. Watching the parade is always free, but over 950 bleacher-style reserved seats will be available to pre-purchase. There will be a record number of livestock at this year's Fort Worth Stock Show and Rodeo. NBC 5 Meteorologist Lindsay Riley introduces us to one of the oldest breeds of cattle in the country. Even before the gates open Friday, NBC 5 reporters and anchors were getting ready for the "legendary" event with reporter Chris Van Horne showing off his riding skills and Mark Fein, Deborah Ferguson, and Eric King showing off their boots in studio. 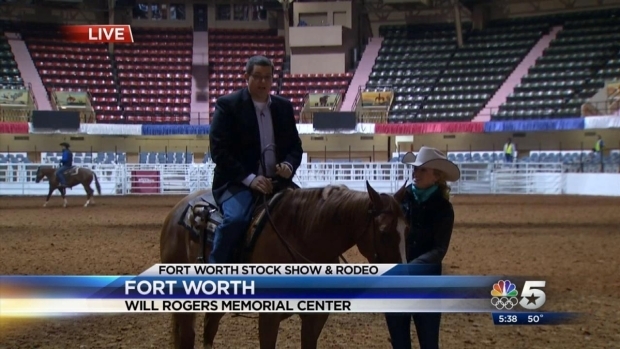 SoCal native Chris Van Horne hops on the back of a horse to preview the Fort Worth Stock Show and Rodeo.